The artwork represents the region's past history of farming, including the Japanese American community's contribution before their internment. 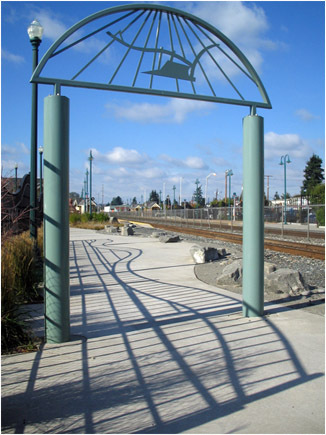 Seven archways, alluding to seasonal cycles, welcome pedestrians onto the platforms, flank the depot and mark the entrance. Text inscribed on bronze ribbons wrapped around the columns, interprets the different geological layers of soil composition in the region. 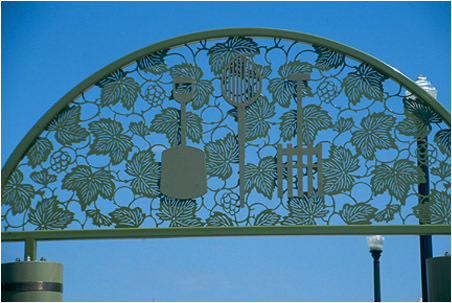 An archway placed at the entrance to a Japanese rock garden is designed to memorialize Japanese American farmers. The artist collaborated in the design of the total station, including transitional spaces, the depots and shelters.